Her Royal Majesty, Queen Hezekiah, wishes to extend her heartfelt hope that all her subjects have a healthy and joyful New Year. Her Private Secretary has made a number of resolutions this year that include finishing more projects, focusing, being more "in the moment" (Typepad wants to correct moment to money....) and exercising (she'll take moving more). 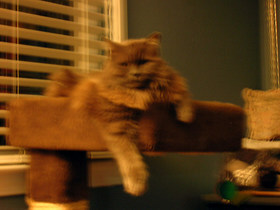 There's a great picture of Hez to be added when I have access to my pictures on a computer and not the phone. Mobile app FAIL. Mind you, no wifi here. Sadly this conflicts with Her Majesty's desire to be an unmovable lapcat. Check out the Traveler's IQ Challenge from Lawyers, Guns and Money. Shockingly - I'm blaming it on the time constraints - I'm unable to tell the difference between Canada, the US and South America. All those years calling myself an American evidently means I've staked the whole freaking continent. 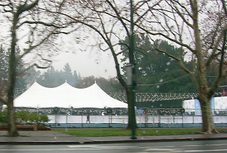 Walnut Creek's winter outdoor ice skating rink on Broadway, between Park Place and what's about to be the old library. TV News: Dexter is coming to CBS on Feb 17th. Y'all have to let me know if it's vastly different from the original. I hear The Daily Show with Jon Stewart and The Colbert Report on back on the air tonight, but only from the Candian Press? And Medium is back tonight, finally. Of course, Bruno and Carrie Ann of Dancing With The Stars show is on tonight too and yes, I will be watching it, live or taped. Sunday night, the 13th, PBS kicks off The Complete Jane Austen with Persuasion. Did anyone else catch Cartographia: Mapping Civilizations by Vincent Virga on BookTV last night? I have this thing for maps and the inside tour of the Library of Congress' Geographic & Maps Division alone was fascinating. Knitting News: Ah, there is none, other than I have a depressingly small amount of stash that's enough to make a whole sweater. It's not like I have just one or two skeins of things either, but I have just-not-quite-enough for the patterns I was eyeing. This is going to make knitting from my stash harder than anticipated. I really do need to inventory it. I'll say one thing. Knitting abbreviations have come a long way in a decade. Hmmm. I know I had some. Hezekiah is deeply unhappy with the state of the weather. She would like someone - anyone - to please put the sun back and can you dial down the wind a bit? And quit it with the rain?